Welcome to our review of the Redfield Rampage 20–60x80mm Angled Spotting Scope. Redfield is a child company of Leupold, manufacturing their optics in China. Even so, the quality of Redfield’s products is usually pretty close to that of Leupold. How well the Rampage 20–60x80mm stacks up, though, is what we are setting out to learn. The tripod is plastic and is adequate for getting started, but the elevation locking screw is not really strong enough to keep the spotting scope from rotating up or down after you lock it. I quickly moved from the included tripod to one of my camera tripods, and was much happier with the outcome. The view-through case is nice, but does tend to limit how much you can rotate the scope. This is inevitable, though, and is easily remedied by rotating the entire tripod when I need to pan further to the left or right. The Redfield Rampage 20–60x80mm Angled Spotting Scope has an 80mm objective lens with magnification from 20X to 60X. Image resolution is fantastic across all magnifications. The spotting scope has a close focus distance of 14.3 feet, and eye relief from 16.6mm (at 60X) to 19.3mm (at 20X). The field of view through this spotting scope is 105 feet at 1,000 yards with 20X magnification and 52 feet at 1,000 yards zoomed all the way out to 60X. How Easy is the Redfield Rampage 20–60x80mm Angled Spotting Scope to Use? 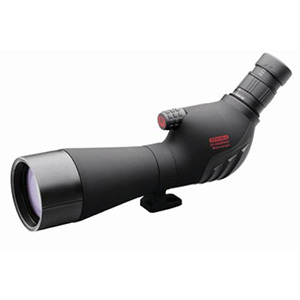 This spotting scope is very easy to use, and the controls are all perfectly placed. The focus knob is very nicely knurled, allowing you to get a firm grip on it even when you’re hands are sweaty or you’re wearing gloves. The magnification wheel, too, has excellent stippling. The Redfield Rampage 20–60x80mm Angled Spotting Scope has fully multi-coated optics with a twilight factor of 40 at 20X and 69.3 at 60X. Images are nice and bright, even during low light conditions. I’ve used this spotting scope to view the surface of the moon as well as Jupiter and Saturn, and have gotten breathtaking views of them even late at night. I was able to see the rings around Saturn quite well through this spotting scope. During bright sunlight, the retractable lens shade does a fantastic job of keeping glare to a minimum, and the treatment on the optics is anti-reflective and of excellent quality. Redfield has manufactured the Rampage with BaK–4 prism glass, which provides fantastic image resolution and clarity. The scope’s optics are definitely high quality glass, living up to even the Leupold name. Focus is fantastic, but I do wish the Rampage had dual coarse and fine focus controls. For a spotting scope in the $300 range, I would think you would get more fine control over the focus than Redfield has provided. The Redfield Rampage 20–60x80mm Angled Spotting Scope is manufactured with a rugged polycarbonate housing, and has O-ring sealed the optics to keep water out. The scope features a standard 1/4–20 tripod show on the bottom, and the glass measures 15" long at a weight of less than 3 pounds. How Durable is the Redfield Rampage 20–60x80mm Angled Spotting Scope? The polycarbonate housing is quite rugged and shock-resistant, and the spotting scope is O-ring sealed to make it waterproof. Redfield has also nitrogen-charged the optics chamber, so the spotting scope is fogproof as well. I’ve used this spotting scope in weather both fair and foul, and it’s never let me down. Thanks for reading my review of the Redfield Rampage 20–60x80mm Angled Spotting Scope. This is a fantastic spotting scope with very few drawbacks. The view-through cover does limit your range of motion somewhat, but I question whether you even need it on an optic that is already waterproof. The only added benefit the view-through case provides, to my mind, is an easy way to carry the spotting scope around.